A cooking griddle with lots of extras! Feel like a chef when using this special Hamilton Beach Premiere Cookware Electric Griddle that is steel and a nice large size with a nonstick surface, backsplash and warming tray. Cook up a special batch of pancakes or french toast with the sizzling bacon and eggs. 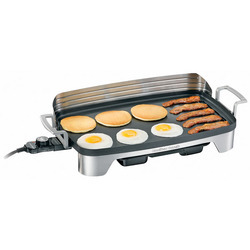 Stainless steel material Provides a strong, durable griddle pan cooking product. Warming tray Is attached and gives a space for placing already cooked pancakes, french toast, bacon, sausage, and other goodies until ready to be served. Backsplash Runs the length of this rectangular griddle, helps control spatters from cooked food, and can be removed for cleaning. Removable power cord Detaches so unit is fully immersible for washing. Non stick cooking surface Is easy to cook on and easy to clean. Grease tray Holds excess grease from cooking foods, and can be put in a dishwasher for cleaning. Adjustable temperature control Ranges from 200º to 400º F to accommodate your recipe cooking requirements.